Off-Grid solar solution systems allow you to store your solar power in batteries for use when you are not on the grid (if you live off-the-grid). 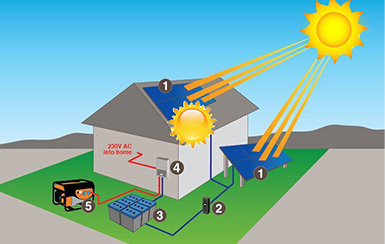 An Off-Grid system is not connected to the electricity grid and therefore requires battery storage and a backup generator. The high cost of batteries and inverters means Off-Grid systems are much more expensive than On-Grid systems and so are usually only needed in more remote areas that are far from any electricity grid. Start Saving on Solar Today! Chennai – 600 015, Tamil Nadu, India.